A protester sits in front of riot police minutes before a mandatory, citywide 10 p.m. curfew in Baltimore April 28, 2015, near the CVS pharmacy that was set on fire the day before during violent unrest after the funeral of Freddie Gray. On Tuesday evening around 10 p.m., the first day of a citywide curfew, only dozens of Baltimore protesters were in the streets, in stark contrast to the hundreds who demonstrated Monday night. Police fired tear gas canisters at some demonstrators who continued to defy orders to leave, and by midnight, 10 people had been arrested. 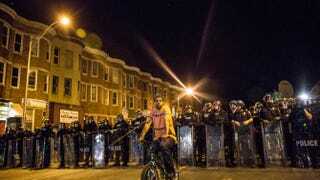 "Curfew is, in fact, working," Police Commissioner Anthony Batts told ABC News. "The city is stable. We'd like to keep it that way." On April 12, Freddie Gray was arrested and then died a week later from a spinal cord injury while in police custody. Since Gray's death, city residents have been protesting the lack of information about his arrest and what took place that caused the injury while he was in police custody. On Monday, some 250 people were arrested and at least 20 police officers were injured in violent protests. At the urging of Baltimore Mayor Stephanie Rawlings-Blake, Maryland Gov. Larry Hogan declared a state of emergency and ushered in some 2,000 National Guard troops. Rawlings-Blake also imposed the 10 p.m. curfew and has said that it will last one week but that it could also be extended, ABC News reported. "They're destroying and undermining businesses and opportunities in their own communities," President Barack Obama said Tuesday. He added that there was no excuse for violence and arson, and condemned the "criminals and thugs who tore up the city of Baltimore Monday night," CNN reported. Baltimore public schools were slated to reopen Wednesday. The Baltimore Orioles and Chicago White Sox also moved their scheduled game to Wednesday afternoon, with ABC News reporting that Baltimore's Camden Yards will be closed to spectators to the game. Read more at ABC News and CNN.